Wildlife is something which sets my pulse racing and pushes my adrenaline level into high gear. Natural world has always fascinated me and even during my childhood I had great inclination towards wildlife. So here we(Monika, Tahir, Sanjog and I) were at our next South Indian destination: Periyar National Park, which is a famous Tiger Reserve of India. Located in the wonderful state of Kerala, Periyar Tiger Reserve is well known for its tigers, elephants and a variety of other wildlife species, including colorful birds. On our way to Periyar from Madurai I told my colleague Tahir that this national park is also a great place for wildlife photography. He is very passionate about photography and this news brought a big smile on his face. He is an IT professional but pursues photography as his passion. 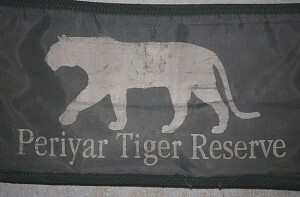 We reached Periyar at night and after having a good night’s sleep, the next morning at 5 am we were all ready for wild encounters. Our jeep safari started at 5:30 am and we were all excited to see wildlife. Our guide Rananujam told us that the park has a beautiful lake, temples and other wonderful spots. 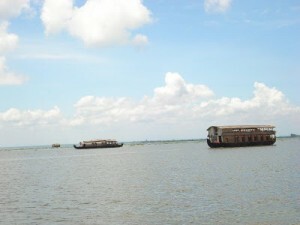 And at the lake visitors can enjoy boating. He said it is a well managed wildlife sanctuary which is also a national park and a tiger reserve, which makes it a favored destination of wildlife lovers. 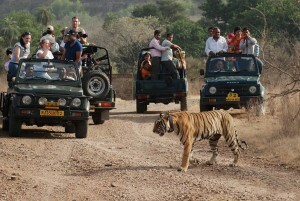 We entered the Park with great expectations to see tiger and other wildlife. 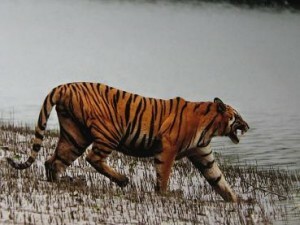 But we didn’t know that by a stroke of good luck we would be greeted by the sight of a tiger and that too so soon. Yes! After covering a short distance inside the park we encountered a tiger and got a golden opportunity to sight it from close quarters. There was pin-drop-silence and we were engrossed in watching an enchanting creature of nature. For a few seconds the tigers gazed at us, and then moved into the deep jungle. The sight was simply breathtaking! It was unbelievable! Our happiness knew no bound and with big smiles on our faces we moved ahead. After covering around 100 m distance our guide spotted something behind the bushes. He asked the driver to stop the jeep and we silently waited to see the creature. It moved and we could catch a glimpse of it. It was barking deer. Next we drove to the artificial lake inside the park where we spotted wild elephants enjoying themselves at ease. Ramanujam told us that this lake is 100 year old. The view of the lake along with its surroundings was very picturesque. We decided to go for a boat ride in the beautiful lake and the experience was too good. As we moved further into the jungle we were greeted with the sights of colorful birds: darters, cormorants, blue-winged parakeets and kingfisher. Further we spotted two monitor lizards basking in the sun. We even saw colorful butterflies. The other attractions we saw in the Park were Wild Pigs, Sambar, Gaur, Indian Wild Dog and Mouse Deer. Driving back we were more than happy and thanked God for giving us a great and rare opportunity of sighting a tiger. Well this experience was enough to leave us with a desire to come to Periyar National Park again. After coming back to our hotel we refreshed ourselves and had evening tea. Now we were ready for another exciting experience- Spice Plantation Tour. Periyar, also known as Thekkady is also famous for its tea, coffee, spice, rubber and vanilla plantation. We went on a spice plantation tour where we enjoyed pleasant weather, gorgeous green surroundings and aroma of spices. Our guide even told us about the spices, their medicinal value and how we can combine different spices to get different flavors. It was such a wonderful experience. With a refreshed mind we came back to our hotel and had a delicious South Indian dinner. Full, we retired to bed early as the next day we had to leave for Kumarokom early morning. Earlier we had decided to go for wildlife safari the following morning but as we had already saw the tiger, so we changed our schedule.